One of the promised features of ColdFusion 11 is to bring "member functions" to ColdFusion's inbuilt data types. Railo's already had a good go at doing this, and has reasonably good coverage. See "Member Functions" for details. One concern I have is whether ColdFusion 11 will implement these the same way as Railo already has. I mean... they should do, there's not much wriggle room, but who knows. If there's a way to do it wrong, I'm sure Adobe can find it. With that in mind, I want to be able to run through some regression/transgression tests on both systems once ColdFusion 11 goes beta, so in prep for that, today I knocked out some unit tests for all the struct member functions. What I did is to go into the ColdFusion 10 docs, go to the "Structure functions" section (to remind me what all the functions were), and write unit tests for the whole lot. I used the ColdFusion docs rather than the Railo ones because the CF10 docs are more comprehensive than Railo's (this is an indictment of Railo's docs, not a recommendation for the ColdFusion ones, btw! ), plus I wanted to make sure I covered any functions Railo might have overlooked. To make this more interesting (because, let's face it, it's not an interesting task; either to undertake, write up, or for you to read about! 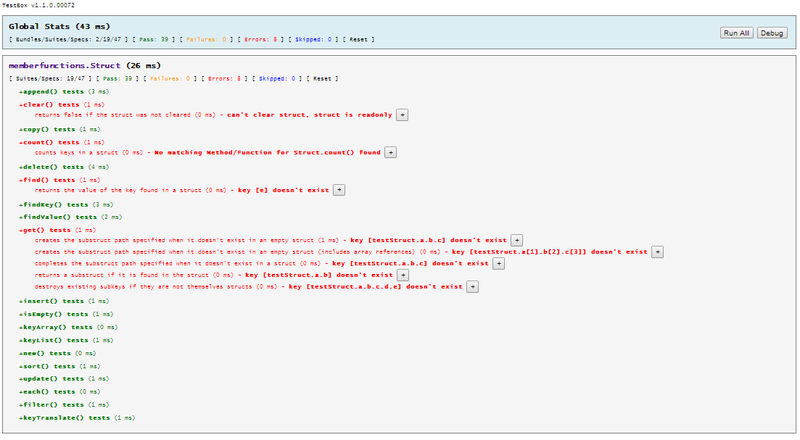 ), I decided to have a look at TestBox's BDD-inspired testing syntax. The short version of this side of things is that I rather like this new syntax. I don't think it's got anything to do with BDD (which is an approach to documentation and test design, not a syntax model), but it's interesting anyhow. Sorry for all of that. Most of it you can breeze over. I've linked back to the TestBox docs for each new test method I use, and have highlighted a coupla discussion points, which I'll review now. The basic gist of this style of testing is that we run() a batch of tests, within which there's groupings of tests which we describe(), and each test within that declares what it() does, has some code (ie: the stuff we're actually testing), and when we say what we expect() it toBe() (toBe() is just one of many expectations we can have. toBe() is the equavalent of assertEquals() in xUnit tests, really). unless the overWrite flag is false. For each member function, I look at the parameters that are possible to pass, and write a test for each of them. This way of using describe() and it() is quite a nice way of grouping things. One random thing to note: having looked up that there was a toBeArray() expectation, I guessed there was a toBeStruct() one. Indeed there is one, but it's not in the docs. I'll let Brad/Luis know about that (guys: now you know). Another thing that I quite liked is how expected exceptions are handled. Instead of passing a "dumb" value to the expect(), one can specify a callback. And this is ultimately run in an error-trapped way which then means we can just chain a .toThrow() the expect() call, and it all just works. Very logical. Lastly in the highlighted stuff is some factoring-out I had to do to allow this file to compile on Railo. Railo hasn't implemented the localeSensitive argument to the structSort() function (or .sort() method), and the test of that causes a parser error on Railo. So in putting it into a separate file, Railo never looks at it. This locale-sensitive functionality doesn't even work on ColdFusion, btw, so no great loss there. Oh! One last one... Railo has a structKeyTranslate() / keyTranslate() function / method. It took me a while to google-up what that was all about (the docs are completely unhelpful), but finally found some notes here: "Struct addressing in Railo". Basically it seems its for converting keys which have dots embedded in them to a hierarchy of keys. That is a hell of an edge-case function. [Boggle]. clear() (and structClear()) don't work as advertised. It should not error if the struct can't be cleared, it should simply return false. This is the documented behaviour. count() doesn't seem to have been implemented. No great loss, but for the sake of completeness, it should have been. find() (and structFind()) both error if the key being sought doesn't exist in the struct. This is not documented behaviour, and is a bit daft. However it's what ColdFusion does as well. It should return null, I think. get() seems completely broken. Or its got some not-obvious syntactical vagary. in testing the issue above, I noticed structGet() also doesn't work quite right when it comes to getting a reference which has array notation in it. It's supposed to create the arrays if needed. Railo creates them as structs. The correct behaviour (creating arrays) is specifically documented in the ColdFusion docs. So unless there's a good reason to act differently, this is a cross-compat bug in Railo. TBH, I think it's stupid functionality, but that's beside the point. Everything else is fine, and ready to go for comparative tests once ColdFusion 11's beta shows up. Now... when will that be? That was a bit of a random article, sorry. But the BDD-inspired TestBox syntax is quite cool, innit? It'll certainly get you practising yer inline function expressions! And writing all that OO code was really a pleasure. So much better than the anachronistic procedural-oriented approach CFML - under the helm of Adobe - has had to contend with until now. It's excellent that CFML is moving forward here. I still wanna do tests for arrays etc too. I'll do that tomorrow. I'll gist the code, but I'll spare you an article on it. But if anything interesting presents itself, I'll let you know. I've also got a bunch of bugs to raise in Railo and in ColdFusion too here. But I can't be arsed just now, so that can wait until tomorrow. I'll cross-ref them back here when I'm done.